These are the bikes that I regularly ride. As you can see, each one features a different wheel size, and none are 700c. I built all of these bikes from the frame up, integrating my favorite components and augmenting the bike’s natural strengths. I sometimes will build my own wheel set unless an appropriate solution already exists in the marketplace. 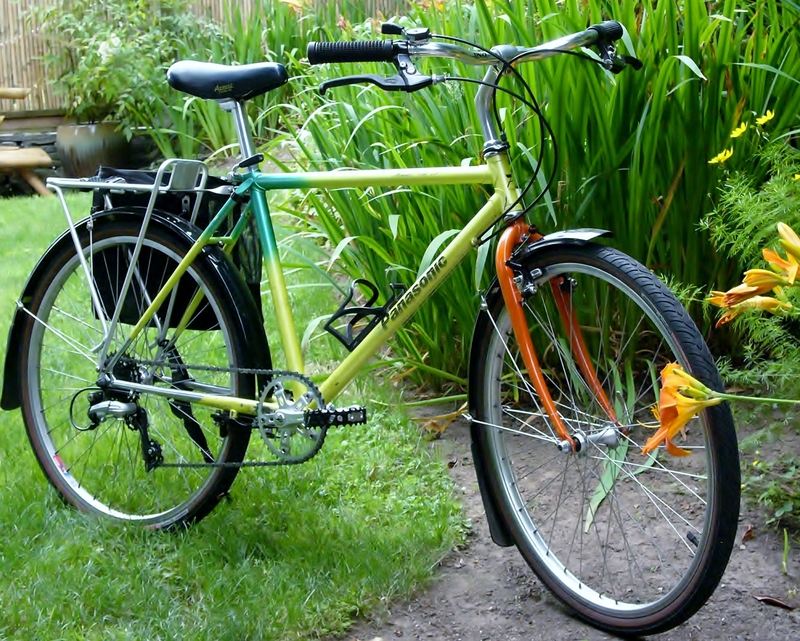 This is the latest addition to my line-up: a 1980 Meral sport touring bike that I converted to 650b. The conversion went well, but I have since modified some of the accessories and changed out the tires and fenders. It’s a wonderful frame made from Reynolds 531 tubing, and is very comfortable on long rides. Weight as pictured 27 lbs. Information about this bike can be found here and here and here and here. This is a mid-90’s Terry Symmetry Tange steel TIG welded frame (left over NOS – not previously built) that I built up using my favorite components, one of which is an early 80’s Shimano 600 crankset from my old Davidson that just keeps on going, mated to the matching Shimano 600 front derailleur. It gets ridden a lot because it handles extremely well, is fast enough, and can go over the occasional dirt and gravel roads I encounter on some of my commute routes. 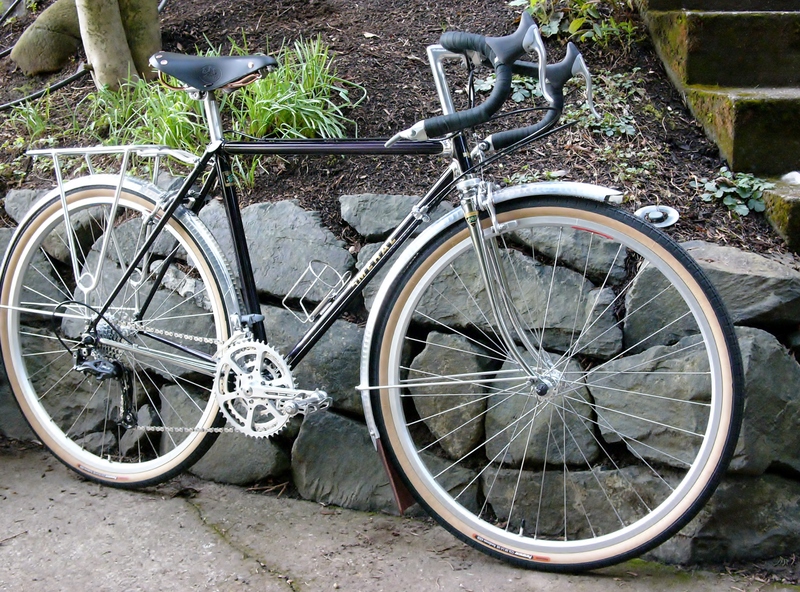 The frame had rack mounts, but no fender eyelets – an odd combination. I built the wheelset, converting its original intended wheel size to 26″ from 650c so I could run 32mm tires, but those tires did not provide clearance for full length fenders, so I solved that problem by mounting fenders over the top of the brake bridge and fork crown. Weight: 25.8 lbs as pictured (w/o bag). This is a 1987 Panasonic MC 7500 that I converted to a winter/errand bike. 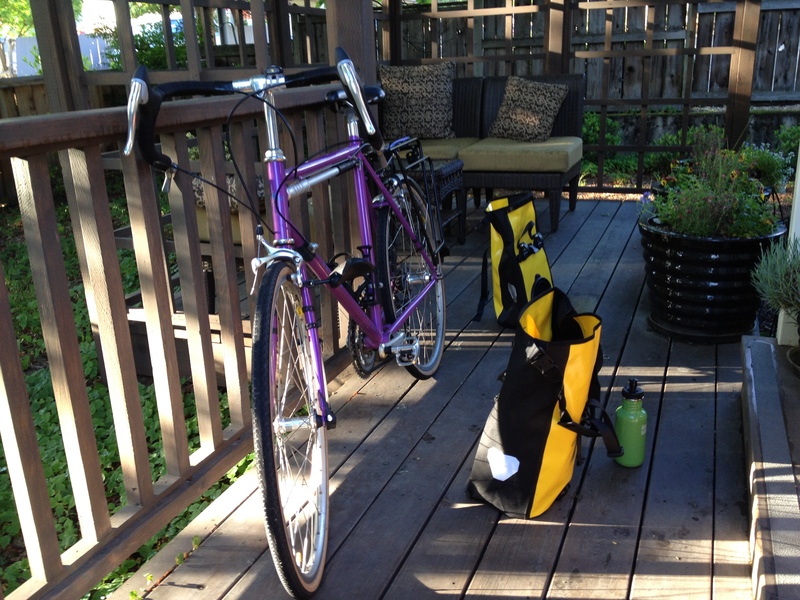 It’s a fun bike to just hop on and ride, and I often chose it for gardening and shopping jaunts. To keep things simple, it is set up with a 1×7 drive train, and no expensive parts, so I don’t mind locking it with a cable lock when I am out running errands. It’s been through a few iterations, which you can read about here and here and here. 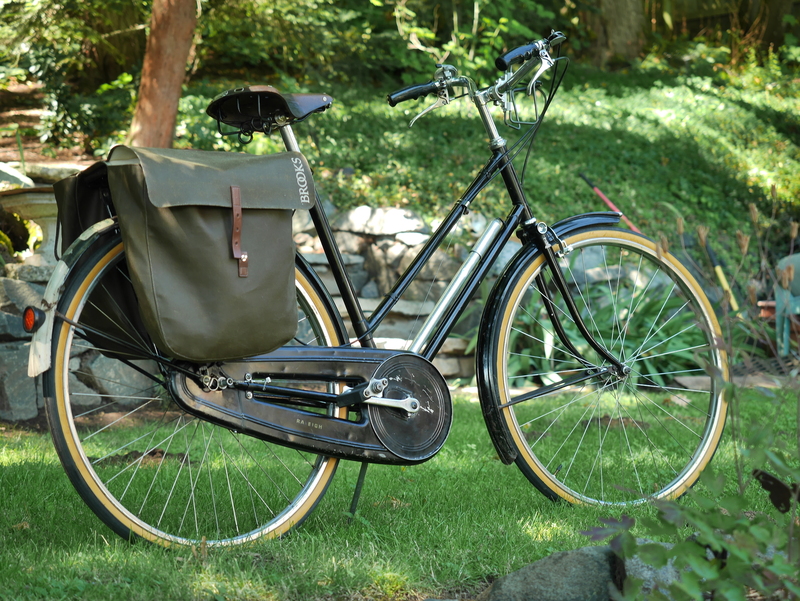 Here is a beautiful 1950 Raleigh Sports Tourist “C” model. It’s one of the first bikes I purchased as I was beginning my bicycle restoration endeavors. It is an amazingly well-preserved quality machine that required only modest attention to make it the delightful ride that it is. The Raleigh quality control of this era is unmatched. This is an early 1980’s Guerciotti with Columbus tubing. The frame features the beautiful engravings and markings typical for Guerc frames of this era. It was originally designed for tight clearances around a 700c x 20 mm wheelset. Because the BB drop was minimal, I felt comfortable converting this bike to 650c, so that I could install fenders and run these 28 mm tires. I equipped it with a Campy Record headset and bottom bracket, and a Centaur compact crankset. The Shimano 105 derailleurs and shifters in friction mode work perfectly with this set-up. This bike likes to climb hills. Just discovered your site. Wonderful !!!! Nora, Thank you for your shared interest in the cycle. I just purchaced a Marguil from Karl. Tinker tinker, so rewarding. I love that duralumin. Gorgeousness and Gorgeosity, as Alex would say. Hi Mike – I don’t have any knowledge of Marguil bicycles. Is your bike similar to the Mercier Meca Dural – using internal steel expanders to joing the tubes – or are the tubes welded/brazed? Wow. How long have you been restoring vintage bikes? One thing for certain: you keep your bikes clean! Hi Jean, I have always enjoyed tinkering and started the collecting/restoring aspect about a decade ago. A clean bike is a happy bike! Love your personal bikes. Especially that custom “Alan”. Thank you, John. Sadly, I the little ALAN has moved on to its original intended owner. For now, I have replaced it with this little gem. Ah, yes … I noticed the Viner conversion also, Nola. Gorgeous. I’m doing a simple rehab on a 1960 Raleigh Sport 3 speed. It’s coming along quite well. My friends Bicycle when we were kids. We both had one, but I gave mine away in ’79. When complete I’ll look for a more sophisticated restoration. I get inspiration from your site/blog and read posts with great interest. Thanks. I hope your project goes well! The Meral is beautiful. At 63 yrs old and 5’4″ I finally conceded that my 1982 Trek 710 19″ frame needed to place me more upright. The new stem seemed unsightly tall. I was relieved to see how tall the Meral’s stem is. My daily ride is my beloved Falcon I purchased in Canada in 1974. I agree with you about SPDs for city riding. I just switched the Falcon back to toe cilpped pedals. I was recently able to find a 1970s pair of cleated Vittorias in my size (maybe the last pair in North America). Long live vintage cycling and Reynolds 531! 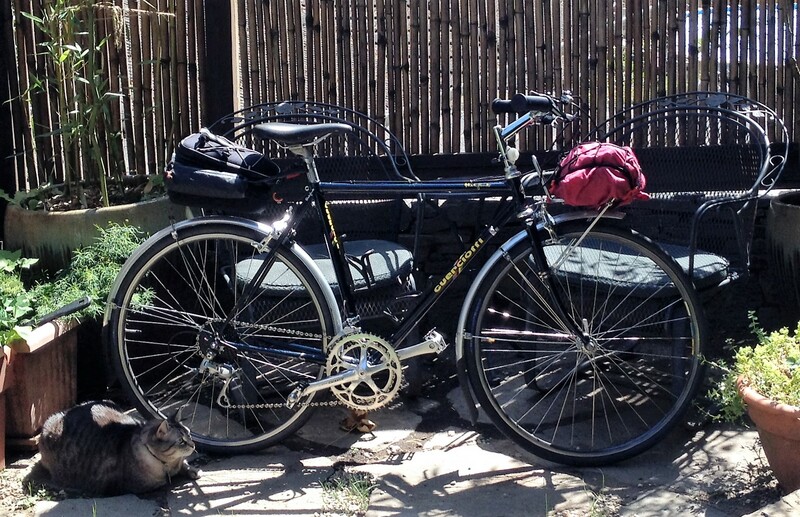 Hi Michael, thanks for sharing your vintage cycling experiences. I think Grant Peterson has settled the score on stem height. Cyclists should not be swayed by racing trends, and should set stem height based on what is best for their riding style and personal comfort, whether young or old. Nola, thank you for your talented efforts to keep classic bicycles in use and ridden and for sharing your work with us. Your skills and “eye” are admirable and refreshing. .
Saddle adjustment takes a lot of patience. Photo was taken long before saddle fine tuning! A too forward saddle will put too much weight on the hands. Glad you are enjoying your bikes, and glad you like the site. What size is the rear rim? Any decent wheel of the same diameter and rim width should work. You’ll want to make sure the axle has the same spacing as the original wheel as well. Probably 130mm for that era. Easy to source if the rear is 700c.